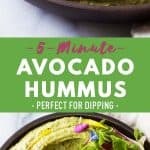 This healthy Avocado Hummus is super duper smooth and delicious! Dip raw veggies or tortilla chips in it or use it on sandwiches or in wraps. We eat a fair amount of vegan meals at home. 100% of our vegan meals contain legumes and hummus is one of the easiest ways to sell legumes to absolutely everybody. Its nutty flavor and creamy consistency are simply delicious! The best part about this Spicy Avocado Hummus is, the spice is added at the end. Thus, it can even be fed to kids and non-spice lovers and adjusted for spiciness by each individual eating. Which hummus flavor is the best? If you ask me: any green hummus, spicy hummus or roasted-garlic-containing hummus. Here I mixed two of my favorite flavors and made spicy avocado hummus! In other words, spicy green hummus. YUM! The greenness comes from two sources: avocado and cilantro. Both are on on the very top of my “favorite foods” list. The heat comes from chipotle chili powder. Some people complain about hummus being bitter and not liking it because of that. There are many reasons why hummus can become bitter. 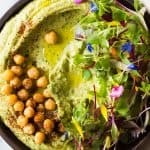 Many ways to avoid hummus from becoming bitter and a simple trick to save already bitter hummus. 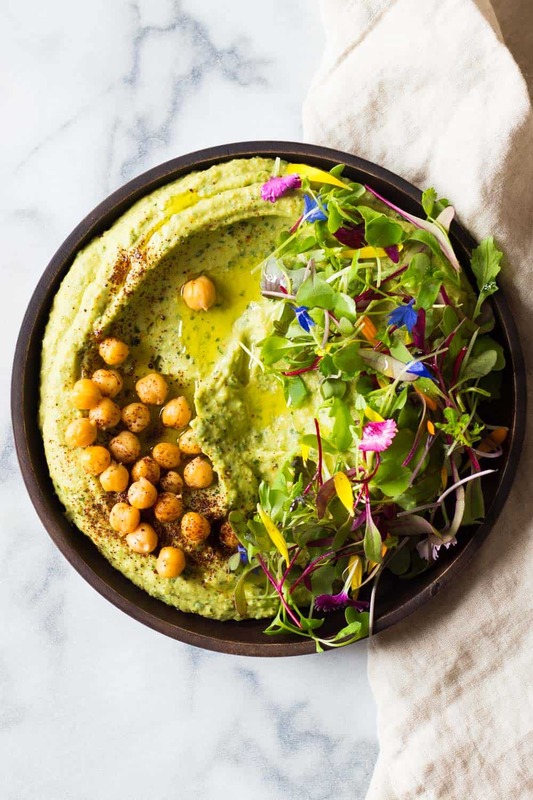 use a good quality flavorless oil such as avocado oil and only drizzle a tiny little bit of olive oil over the already smooth hummus once it’s plated instead of adding olive oil during the chickpea processing. use very little tahini from either a good quality brand or make your own tahini. Tahini is supposed to give a hint of a sesame taste. Consider it a “spice” a little salt makes everything delicious, too much of it and it becomes gross. when squeezing the juice out of your lime or lemon make sure you don’t squeeze to the last drop. The last drops are super bitter, not sour. The white skin on the flesh, the one that separates flesh and peel is extremely bitter and if you squeeze the citrus super hard bitterness gets mixed into the deliciously sour juice. Now, sometimes we don’t know why hummus is bitter or we didn’t know beforehand that the olive oil or tahini brand we bought was going to turn out bitter. Do we have to toss the whole batch of hummus? NOOOO!!! No need to toss it. Just “repair” it. Just like when you over salt something adding sweetness can even that out, the same applies to bitterness. If something is too bitter, add a bit of honey and you’re good to go. I like adding honey to my hummus by default to make sure it’s not bitter but if it does turn out bitter I just add a tiny little bit more and it’s all saved. Now, this trick applies to any hummus of course. The secret tip is to peel the chickpeas out of their skin!!! Yes, this can take a while but it’s worth it. It’s worth every single minute you invest. It works with both canned and homecooked chickpeas. You just press a chickpea between thumb and index finger and it flops right out. Remove the skin and add only the “naked chickpea” into your food processor. It makes an incredibly smooth and creamy hummus. Add avocado and process long enough for both ingredients to become super duper extra creamy and smooth. If you need more in-depth info on why exactly hummus is healthy, I encourage you to read this article by WebMD which talks about all the benefits of eating hummus. They go into great detail about why it’s healthy and when it’s not. 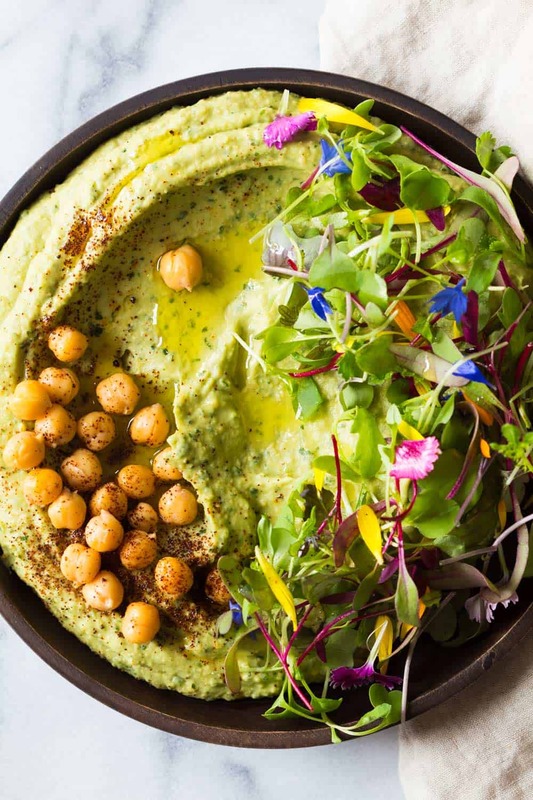 This healthy Avocado Hummus is super duper smooth and delicious! Dip raw veggies or tortilla chips in it or use it on sandwiches or wraps. 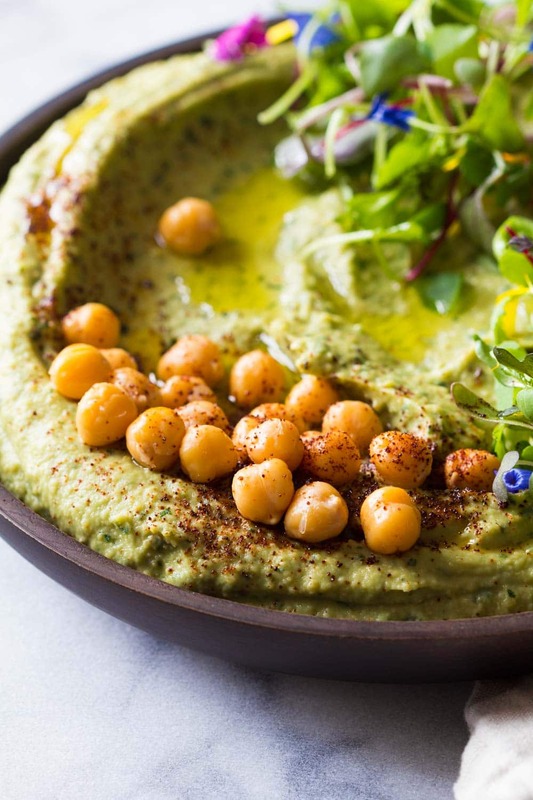 Add chickpeas to food processor (for extra super duper smooth hummus take an extra 5-10 minutes to peel chickpeas out of their skin by gently pressing between thumb and index finger until they flop out of their skin - TOTALLY worth it!). Put a small hand full of chickpeas aside for decoration. Destone and peel avocado and add to food processor. Wash cilantro and cut off as much of the stems as possible. Add to food processor. Add, tahini, avocado oil, sea salt, lime juice, water and honey to food processor and process until super smooth. Give it a try and adjust salt and honey content to your liking. Serve on a plate, and decorate with greens and whole chickpeas, drizzle olive oil over everything and sprinkle chipotle chili powder on top.